RANGERS have put themselves in a great position to reach the Premiership play-off final after a stunning 2-0 victory over Hibs. Stuart McCall said in his pre-match interviews that a victory wasn’t vital in tonight’s semi-final first leg but his players gave him just that and a whole lot more as they put in a fine display in front of the Ibrox faithful. Nicky Clark fired his side ahead in the 44th minute from six yards after Haris Vuckic and Richard Foster had combined brilliantly, with the latter providing a great assist. The stadium then went wild again just after the hour mark when a Lee Wallace header made its way through to Kenny Miller who guided the ball past Mark Oxley with a tidy finish with the outside of his left boot. The result at the final whistle was no more than Rangers deserved and while Hibs looked dangerous in spells, McCall should be delighted with the effort and commitment his players showed on what was a massive night for the club. The opening 10 minutes were, as expected, played at a break-neck speed with both teams flying into challenges. Dean Shiels, in particular, was seeing a lot of the ball albeit it was Liam Craig who had the best effort on goal early on. The Hibs skipper tried his luck from distance with a low shot which flew past Cammy Bell’s far post before smashing into the electronic advertising boards in front of the Copland Stand. Craig was finding pockets of space on the left side of Hibs’ midfield and on 15 minutes he again picked up the ball and unleashed a drive which flew harmlessly over the bar. The high tempo of the game was making it an intriguing contest for the 41,236 fans in the ground albeit Rangers were struggling to test Oxley. The first shot of note came from Miller on 22 minutes when he fired a left foot drive straight at the visitor’s number one. On the half hour mark tenacious play from Nicky Clark resulted in the striker being hauled down by Scott Robertson as he tried to edge into the 18-yard box from the left side. The Hibs man received a yellow card, more for his protest to the ref than the challenge, and from the free kick Nicky Law tried to find the far top corner but Oxley was there to palm the ball away. 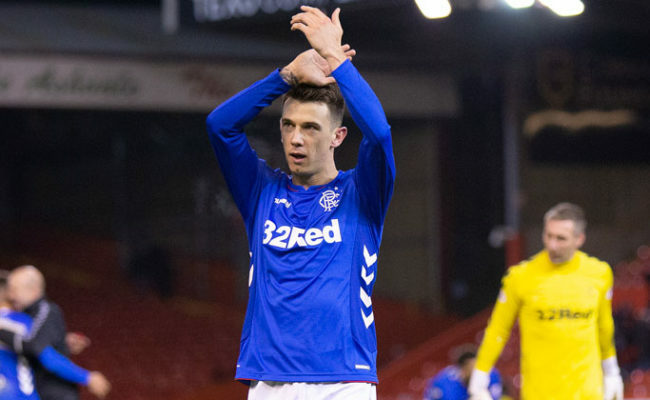 The Rangers fans were in fine voice, knowing the full importance of tonight’s first leg, and on 44 minutes they were rewarded when Clark opened the scoring with an excellent goal. Vuckic waited and waited 20 yards from goal and when Foster darted in from the right behind the Hibs left back Lewis Stevenson the Slovenian played a lovely flicked pass over the top to his team-mate. Foster hit the ball first time across the six yard line and Clark was there to divert the ball coolly into the net. As the net bulged Ibrox erupted and the supporters stayed on their feet until the team walked down the tunnel at Calum Murray’s whistle. Rangers continued where they left off as the second period started and just five minutes in Oxley had to dive low to his right to make a fine stop to deny Vuckic. With the game now flowing from end to end Hibs then went up the park and won a corner. 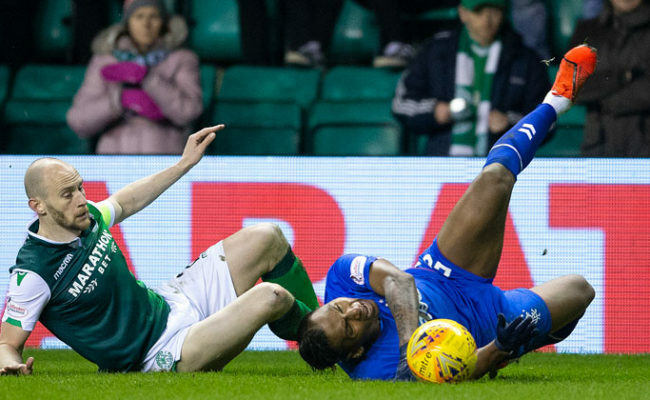 From the delivery Malonga managed to squirm away from his marker but he could only head the ball on to the roof of the net as he fell to the ground. With top scorer Jason Cummings and the powerful Malonga in attack, Rangers had to retain their focus but in general Stuart McCall’s four-man back line looked confident and assured with Wallace and Foster pushing forward at every opportunity. On 62 minutes the Light Blues again created a good opportunity with Nicky Law doing well on the left. His chipped delivery to the back post was for Vuckic but a defender did well to get to the ball first under pressure. 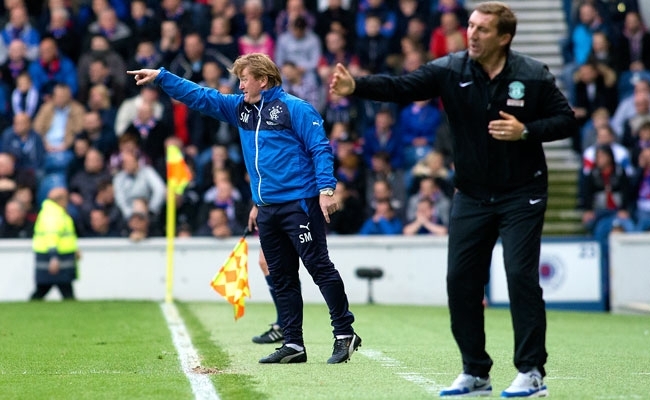 Two minutes later and the Hibs defence was caught out again as Rangers doubled their advantage through Miller. Shiels had a shot blocked initially but when Wallace headed it back into the box it ran through for Miller who slotted a low shot past Oxley with the outside of his left boot. 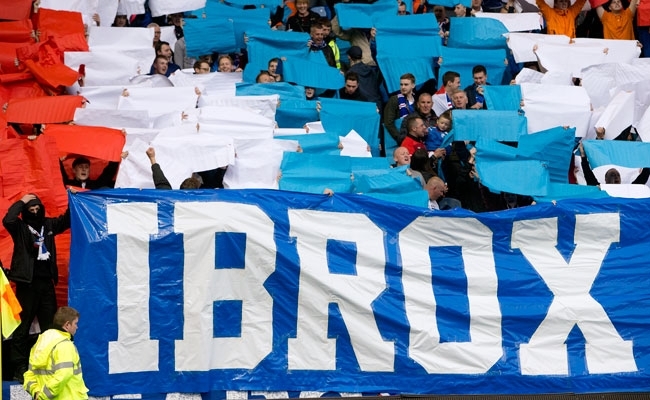 Ibrox was now rocking and as opposed to sitting back the players in blue kept the pressure on as they looked for a third. In the latter stages Stevie Smith, Ian Black and Kris Boyd were introduced as McCall added fresh legs and although Hibs threw men forward in a desperate bid to get a goal back the Gers defence stayed watertight. As the game moved into injury time the Rangers fans again raised the roof to help the players get over the finish line but before the final whistle the impressive Foster cut inside and his left foot shot from 30 yards had to be tipped over. 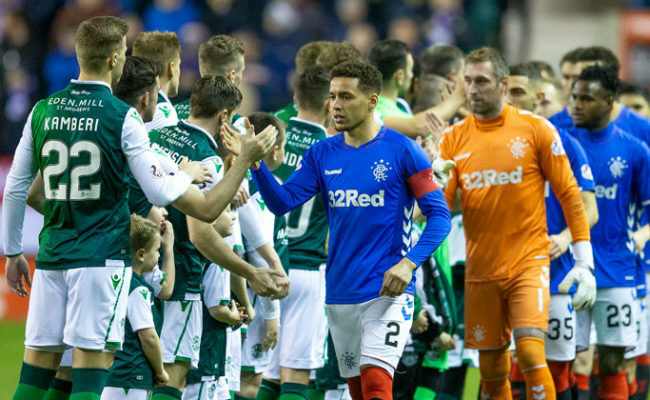 The job is not done yet but Rangers might well have taken a big step towards the play-off final and another step closer to Premiership football.